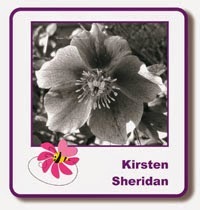 Good morning, Kirsten here with a scheduled post, hope you all had a lovely weekend. Today's projects are two acrylic tags from That's Crafty! & they are my final projects for October. 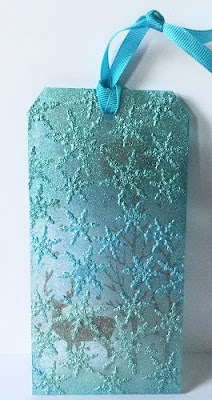 As I said in a previous post, acrylic is very hard to photograph properly - at least it is for me - so if you're attending Lisa's next two classes you can see these tags there. On one side of the first tag I applied Red & Green Starlights through the Imagination Crafts' Christmas Poinsettia panel stencil. As usual, I built up the colour by adding thin layers, allowing each one to dry before adding another. 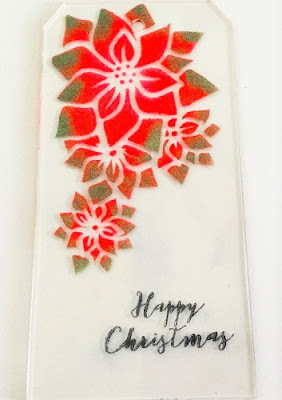 I also stamped the greeting from the Hobby Art Christmas Frosting stamp set with Jet Black Stazon ink. Again, always use Stazon, it's the only ink that will dry on acrylic. When the Starlights & the Stazon were dry I turned the tag over & applied white gesso through the That's Crafty! Snowflake Background stencil. Once the gesso was dry I used a brayer to apply Diamond Sparkle Medium to both sides of the tag & when that was dry I added gold Stickles to the centres of the poinsettias. 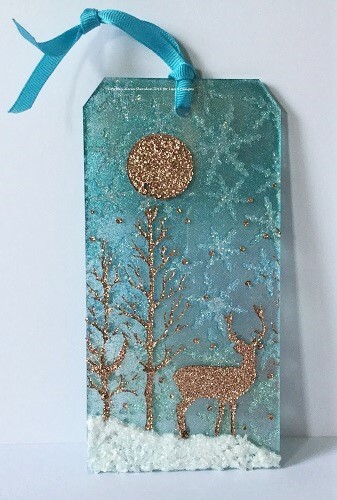 For the second tag I applied Diamond Sparkle Medium through the That's Crafty! That's it from me for today, next week sees the start of our November projects. I'm looking forward to seeing many of you at Friday's classes in Fant Hall, Maidstone. Love the transparent effects with the acrylic tags! I particularly like your second tag, the colours are just gorgeous, Kristen! Thank you very much! I was pleased with how they turned out.